The colored part of the eye is called the iris. The color of your iris is determined by the genetic material inherited from your parents. Most people's eye color remains constant after the age of 3. Eye discoloration can, however, occur later in life and may be caused by genetics, disease or medication. You should consult an ophthalmologist if you notice changes in the color of your sclera --- the white part of your eye --- or your iris to rule out medical problems. Although eye color is generally believed to be hereditary, scientists are beginning to understand that there is a complex, multi-genetic process that really dictates eye color. One aspect of this process is the creation of melanocytes, or the cells which create pigmentation. People who have blue eyes have little to no melanocytes in their iris while people with brown eyes have the largest number of melanocytes. Melanocytes are also responsible for hair and skin color. Just as aging can trigger biological changes to melanocytes in hair, resulting in grey hair, it may also cause changes to melanocytes in the iris, resulting in changes in eye color. Eye discoloration can sometimes be a symptom of certain diseases and medical conditions. Primary acquired melanosis, for example, is a medical condition that most often affects middle-age or elderly caucasians, resulting in a brown patchy appearance to the sclera of the eye. While primary acquired melanosis does not generally affect the health or functioning of the eye, it must be monitored. According to researchers at the University of Utah John A. Moran Eye Center, certain forms of primary acquired melanosis can progress to melanoma, a very deadly form of skin cancer. Other diseases and medical conditions that can cause eye discoloration include Addison's disease, macular degeneration, and pigmentary glaucoma. Eye color changes can sometimes result as a side effect of medication or herbal supplementation. Argyrosis is a condition in which the sclera develops a bluish gray color due to the deposit of silver into the skin tissue and is generally caused by excessive intake of silver salts. Latanoprost, a medication used to treat glaucoma and eye pressure conditions, can increase brown pigmentation in the eye, causing light eyes to become darker. Long term use of prednisone may also cause discoloration of the sclera. 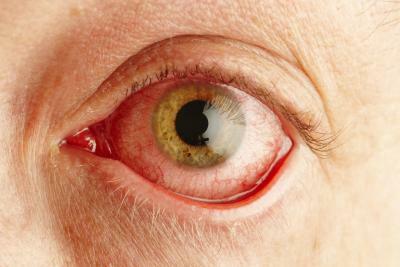 Eye discoloration may sometimes occur as a result of injury to the eye. Stanford University geneticist Azita Alizadeh cites singer David Bowie as an example of a person who experienced eye color changes due to injury. Bowie, who appears to have one dark eye and one blue one, received an eye injury during a fight which caused his pupil to remain enlarged, giving the appearance of one darker iris. Injury to the eye can cause permanent discoloration to the sclera or may cause injury to the melanocytes, causing them to increase or decrease pigmentation production. EyeNet Magazine: The Whites of My Eyes Have Turned Blue!